Believe it or not, drinking from the best whiskey glasses can make your favorite whiskey, scotch, or bourbon taste even better. We spent a lot of time researching different styles and brands of glasses. It was probably some of the most fun we’ve ever had doing research. We think. 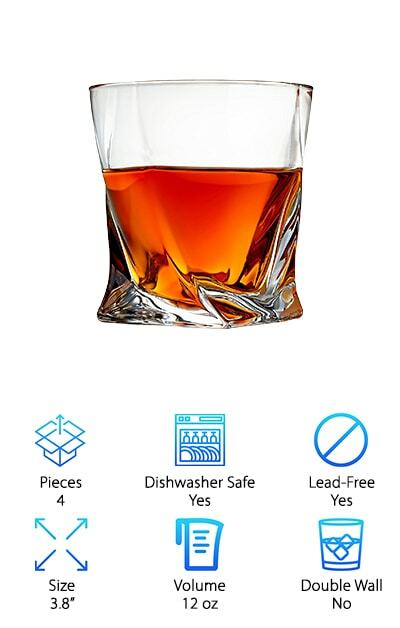 Before we get into the whiskey glass review we put together, let’s take a look at some of the important features you need to know about before you shop. Pieces: All of the glasses we chose come in sets of 2 or 4, perfect for a place in your home bar. There’s one noticeable exception of a set that also includes an awesome decanter, too. 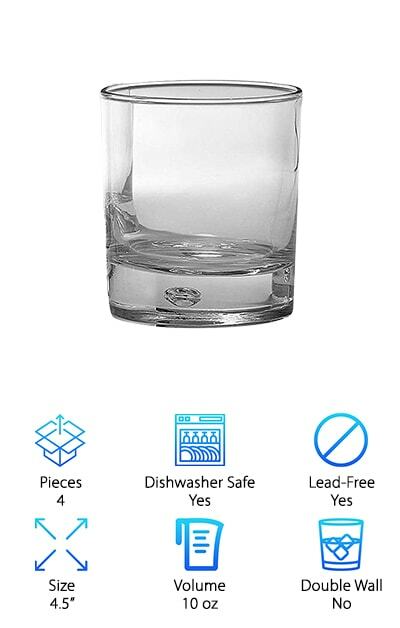 Dishwasher Safe: Having dishwasher safe glasses is a nice bonus. It makes clean up a breeze. 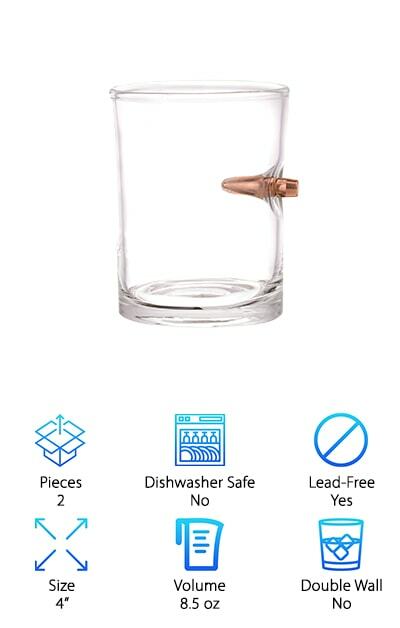 Please remember not to put a glass in the dishwasher unless it’s safe to. Some of these have delicate details that might not tolerate it. 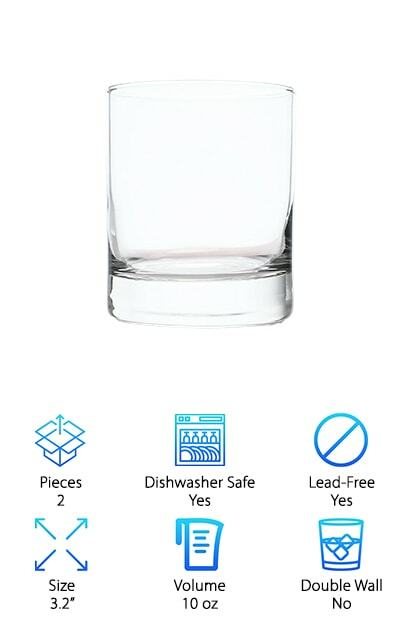 Lead-Free: Some common drinking glasses use a kind of glass crystal that is made with lead instead of calcium. 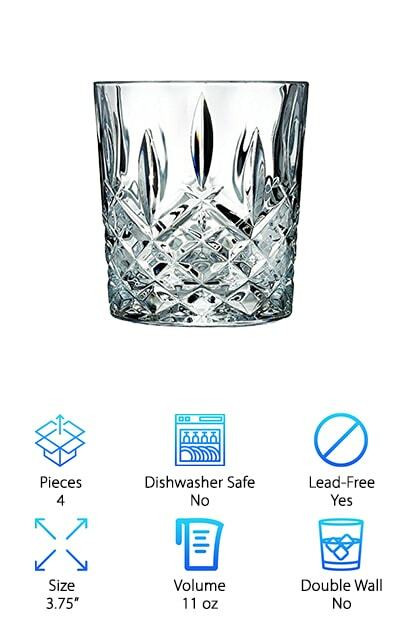 While these are safe to drink from, none of the glasses that we chose uses lead based glass. Size: These glasses come in a few different shapes, each a different size. Here, we’re referring to the height of the glass. Traditionally, whiskey glasses are on the short side. They range from 3.2 to 4.5 inches. Volume: If you prefer your whiskey on the rock or enjoy mixing up some old fashioned, you should look for a glass with a larger volume. If you like your whiskey neat, a smaller glass will do. We chose glasses that range from 6 to 12 oz. Double Wall: We didn’t pick a lot of double-walled glasses but it’s a feature that a lot of our picks tried to replicate. A double-walled glass basically puts a buffer between your hand and you drink. It keeps it colder, longer. Now that you know what to look for when trying to find an awesome set of glasses, let’s get right into our reviews. Here’s the deal: if you’re running short on time or just want some quick ideas, we put our top and budget picks right at the top of the list. That way, you can get a good idea of what’s available. If you really want to find some awesome products, stick around. Alright, cheers! Let’s get started! One of the reasons that this set from Glencairn is our top pick for best whiskey glasses is because they’re fit for royalty. Seriously, they won the 2006 Queen’s Award for Innovation. What’s so special about them? They’re designed to experience all the elements of a glass of whiskey. You’re probably wondering what that means. It’s all in the shape. The rounded bowl tapers up to the rim. So, before you take a sip, you’ll get the enhanced aroma as the whiskey moves from the bowl of the glass toward the rim. Plus, the clean, clear design allows you to appreciate the color a little more. 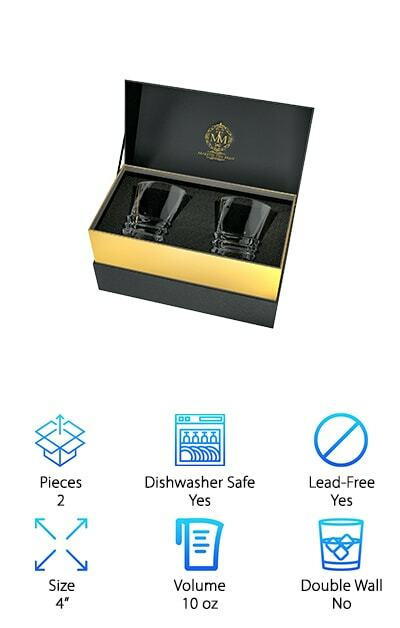 These glasses look classy and clean and are a great way to enjoy your favorite spirit. They’re made in Europe by Glencairn Crystal and come in packages of 4 glasses. These may be our pick for budget glasses for whiskey but they are not short on style. In fact, they look so unique that we just had to include them in these reviews. These glasses have a double-wall design that helps keep the drink cold for a longer time. Instead of the heat from your hand traveling right through the glass to warm your drink, the double-wall provides a buffer between your hand and your whiskey. The glass is really clear, too, with no air bubbles or other imperfections between the walls. This design also makes them really durable so they’re great for everyday use and can safely go in the dishwasher or even microwave. This is a set of 2 and they each hold 9 oz so you can get a pretty nice size drink. The Markham Glasses from Marquis by Waterford are a bourbon glass set that is perfect for old fashioneds. Double old fashioneds, actually. The traditional Irish Markham pattern gives these glasses some elegance and a stylish twist. It’s one of the things we liked most about these glasses, the weight of the glass and the sparkles in the design really made out drinks feel a little more special. They’re made of crystalline in Italy can hold an impressive 11 oz. If you prefer straight drinks, these make some of the best bourbon glasses, too. These are a great set to use for a party or when entertaining guests but they’re durable enough that you can use them to enjoy a drink alone or with your partner at the end of a long day. 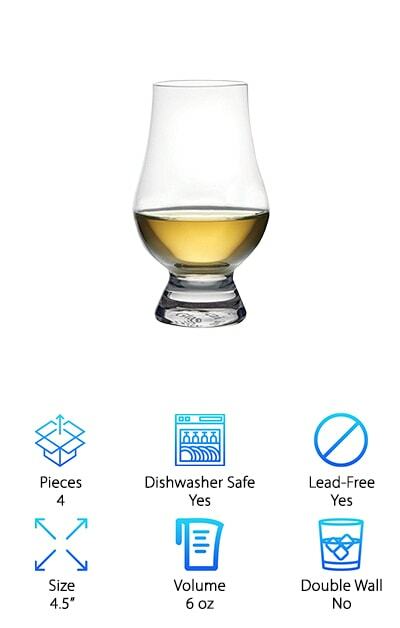 Our next pick for best scotch glasses and from Taylor’d Milestones. They’re a good side and fit nicely into your hand. They’re designed to help you keep your drink cold. By modifying the design of a double-walled glass, Taylor’d Milestones was able to get you the same benefits in a single-walled glass. How’d they do it? The base and sidewall are thick and give more of a buffer between your hand and drink. This idea is something that’s been done, but here’s why this one does it so well: the glass remains crystal clear. And here’s another unique thing about them: each glass has a small diamond etched into the bottom. This is one of those little added touches that makes such a difference in style and flair. These simple glasses are not as simple as they might seem! This set from Paksh Novelty not only includes some great glasses but also a beautiful matching decanter with a beveled fluted stopper. 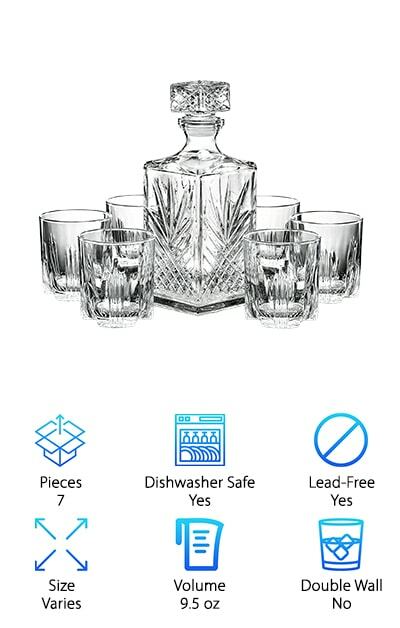 This is a great set to keep out in your home bar or bar cart or to use for entertaining. It just looks really classic and elegant. All of the items in this set were made in Parvo, Italy from the best raw materials. The design is really beautiful, too. It’s a classic diamond cut that resembles a starburst that reflects the light and adds something special to the design. You’ll find it on the glasses, decanter, and even the on the stopper. The effect when the light makes the whole set sparkle is really a great way to enjoy a drink. We really can’t say enough about the craftsmanship of this set. 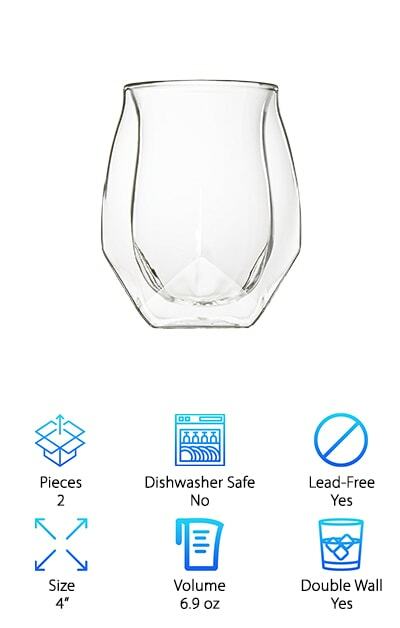 When we came across the Circleware Whiskey Drinking Glasses, we first noticed the simple, classic look and knew we’d found one that should be considered for best tumbler. 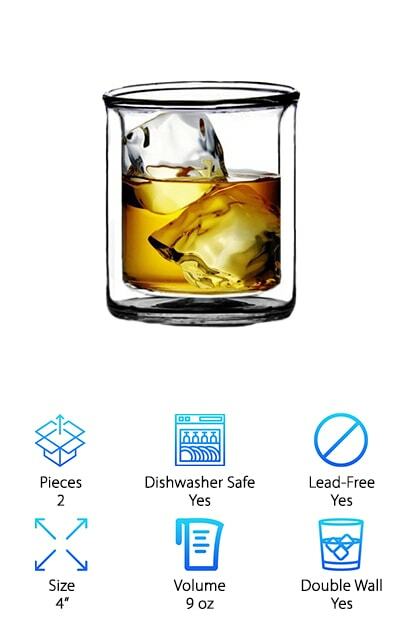 This set includes 4 simple whiskey glasses. Each is 4.5 inches high and can hold 10 oz. The thick, beveled base gives you something solid to hold onto. Then, it tapers a bit up the glass. This thick base is to help keep your drink cold by providing more distance between your hand and the drink. It’s basically using the idea behind a double wall glass and applying it to a single wall. We loved the bubble accent, too. A perfectly formed air bubble is enclosed in the thick base which adds a little visual interest to an otherwise classic, simple design. These glasses are dishwasher safe, too. If you’re looking for something really unique, check out this hand blown, handmade whiskey glass set from Norlan. The design was refined by a master distiller so you can be sure this is a glass made for whiskey. It has a really modern design made from borosilicate glass. First of all, the double walled design will help keep your drink cold. It has a unique, concave shape that makes the upper rim fit just right under your lip. It’s made from two separate molds, one for the inner wall and one for the outer one. The two pieces are then joined together, making this a lightweight, hollow, and fluid looking design. The shape of the inner part gets just enough of the aroma to your nose without being overwhelming. This really is a unique design experience. If you’re looking for the best whiskey glass with a modern twist, check out these Venero Whiskey Glasses. For starters, they’re made with crystal clear glass and look exceptionally lustrous. There’s some weight to this glass thanks to the thick walled design. This adds durability as well as a way to insulate your drink and keep it cold. They’re not easy to break. This is a big glass, too, 12 oz in all, enough room for a generous pour over the rocks or a mixed drink. What’s so unique about the design? There’s a twist - literally! It looks almost as if you took a normal glass and twisted it on the base. It’s a great effect that works well with the high quality of the glass. It creates some ridges and adds a lot of shine. If you’re into the art deco designs of the 1920s and 30s, then this is the set for you. This set includes 2 glasses, each able to hold a generous 10 oz. The bottom of the glass consists of a stacked, tiered design that transitions into a slightly flared glass. The glass is clear and lustrous and the design adds a lot of interesting details. They really catch the light and the whiskey filling the glass looks almost like it’s on display. Not only do they look great, they’re also really well made, durable, and dishwasher safe. This set makes a really awesome gift, too. It comes beautifully packaged in a black pleather box with gold accents and the brand monogram embossed on the top. This is a gorgeous set that any whiskey drinker would love to own.